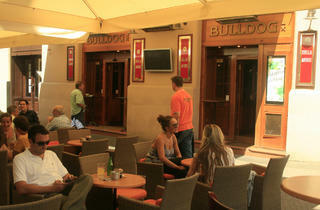 The anchor of the café and pub scene on the buzzing street between the Hotel Dubrovnik and Flower Square (parallel to and one street south of the main square), Bulldog offers something for everyone. 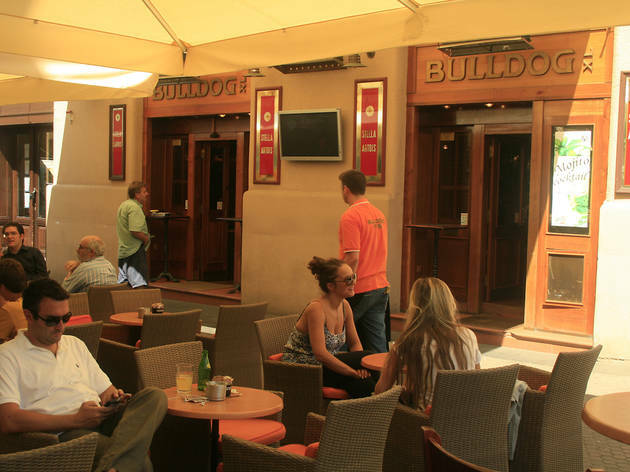 The interior is upscale: electronic sliding-glass doors; big flat-screen TVs for match days; a wide selection of Belgian beers on draught; cocktails; wine; and the standard list of coffee concoctions. A terrace leads to a boat-shaped front room with its giant-paddled, propeller-shaped ceiling fans, deck flooring and mezzanine observation level. Downstairs, a club, with green leather chairs and marble tables around a bandstand, hosts pop-rock cover bands, blues and jazz at weekends, no cover charge.